Live chat is a must for your business. It is well known that a customer selects a business when their priorities are quickly defined and live chat is one of those media that helps business in this regard. Wondering what are the benefits of a live chat? Then you make the point that this is a survey and that 65% of customers return to a website that offers the possibility of a live chat. However, the question is why a customer feels comfortable in live chat. And how does this ultimately help a business? To help you better understand how valuable customers are to live chat access. With such numbers, it's easy to understand why customers are coming back to companies offering live chat. Customers feel safer when dealing with companies that make support simple, straightforward and instant. With Live Chat, you can quickly answer questions about your products, solve problems faster, and assure your customers that you're always there. This is a simple but very effective recipe for improving both customer service and loyalty. However, in live chat, administrators and supervisors have access to all chat logs that can be sorted, searched, and filtered to quickly identify customer weaknesses. 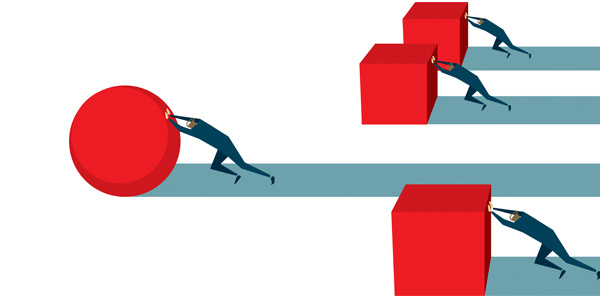 As a result, management can easily identify the problems or needs of their customers and find ways to resolve and resolve them. Telephone support is the usual method used by companies for customers, but it can be very expensive, both in terms of tools and cost per person per hour. 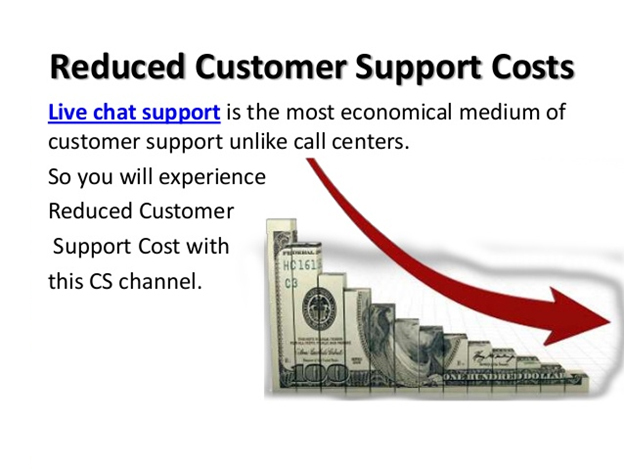 Live chat does not cost much more than a high-quality email provider and costs much less than phone support. This is mainly because live chat gives your agents or team members the opportunity to serve multiple visitors at the same time. On average, most live chat agents can handle three or more chats at the same time, if they are properly trained. This advantage of live chat allows companies to save a lot of staff because some live chat agents can serve as many customers as a larger team of telephone support staff. Live Chat allows agents to quickly create shortcuts to help or quickly form documents through the chat window. Instead of guiding users step-by-step through troubleshooting and solution procedures, agents can directly associate the visitor with the appropriate document or content. The screen sharing features allow you to quickly and efficiently solve the most complex problems to solve. Studies have repeatedly shown that live chat helps to increase sales. One report indicates that customers who use live chat make purchases three times more than others. 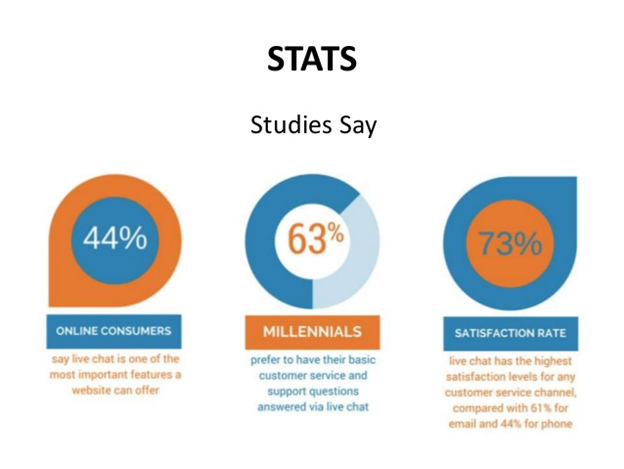 These numbers clearly show that live chat is effective at generating leads and making sales. Your team has many more opportunities to turn these visitors into paying customers. Live chat can help you expand your reach in areas you never thought possible. Thus, if you receive a request from someone on the other side of the world, you can welcome him and give him the same welcome and consideration as someone visiting your office or business. Live Chat gives your website visitors instant access to salespeople and support staff. If your visitors can easily contact you with questions or problems, they will be more confident in your business as a vendor and a source of valuable knowledge and support. 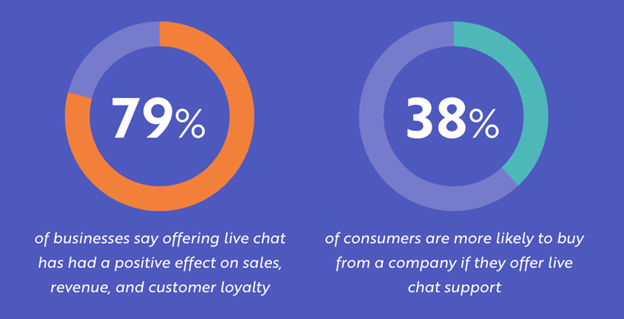 If you look at the report, you'll find that live chat makes it easy for your customers to do business with you, which means they usually respond with higher loyalty and higher costs. This also leads to better reviews on websites like Amazon, or your own website, which can also attract new customers. Modern live chat systems not only allow agents to receive but also initiate chat requests. Live chat platforms can use advanced monitoring and tracking capabilities to inform visitor agents of Web sites and provide useful data for initiating conversations. Agent chat requests can be sent manually or automatically based on predefined rules. This type of proactive discussion initiation can help visitors find the information they need faster and potentially turn more browsers into buyers. According to a recent report, many large companies still do not use live chat systems on their websites. A recent study found that only 10% of websites use live chat to provide real-time customer support. This means that if you choose to install live chat software on your sites - and you should - you will probably have an advantage over your competitors for immediate and user-friendly support. You also have more opportunities to proactively engage visitors to your website and make more sales. Therefore, if you want to differentiate your business and increase the number, it's time to implement live chat on your sites, not later. Read some of the best practices you can apply when adding live chat to your sites. With high-quality live chat providers, you can view all types of custom reports and the chat histories of all your agents. By accessing this type of data, you can see how many visitors your site receives, how many chat requests are being accepted or ignored, and a range of other visitor metrics that help you better implement marketing strategies for more traffic to achieve. Live chat analytics also give you valuable insights into your agents. Pair visitor data with access to chat histories, agent performance reports, wait for reports, and more, and you can monitor agent performance and customize staffing and training as needed.